Had this in my wish list for awhile, and it's just gone live as a lightning deal! Five Ports: 1 USB-C port with Power Delivery and 4 standard USB ports with PowerIQ allow simultaneous multi-device charging at high speed. MultiProtect Safety System: Keeps your devices safe with surge protection, temperature control and more advanced safety features. 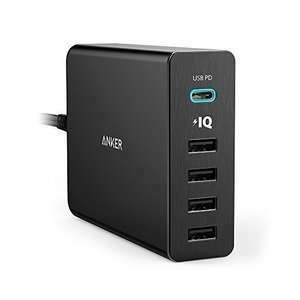 What You Get: Anker PowerPort+ 5 USB-C with USB Power Delivery, instruction manual, AC cable, our worry-free 18-month warranty and friendly customer service. Looks like my one.. the usb c does upto 20v output perfect for Dell tablets/Mac's/chromebooks etc. Really cheap USB c for those features. However the regular ports are not QC.. but they do 5v@2a which is fast enough anyway. All in all a superb product. The usb c however is crap at charging my LG G5. I use the regular usb ports which a usb to C cable, which then works great. Got this wall charger a couple of weeks ago and really like it. The PD port also charges my MacBook pro (albeit slower than original charger). That's cool man, I mainly bought mine to be able to charge my anker powerbank using the type c PD port, as the powerbank has one too! Looks like my one.. the usb c does upto 20v output perfect for Dell …Looks like my one.. the usb c does upto 20v output perfect for Dell tablets/Mac's/chromebooks etc.Really cheap USB c for those features.However the regular ports are not QC.. but they do 5v@2a which is fast enough anyway.All in all a superb product.The usb c however is crap at charging my LG G5. I use the regular usb ports which a usb to C cable, which then works great. I got it for my dell tablet, it worked a treat! I use it with a 3M C to C cable from amazon and ts working well. Chances are you got something similar but not exactly like this, like no USB-C, or no USB PD even if it did have a type C port. Or maybe it's not rated for 60W draw. Maybe you should've bought them instead? Proof? Model number, receipt?Chances are you got something similar but not …Proof? Model number, receipt?Chances are you got something similar but not exactly like this, like no USB-C, or no USB PD even if it did have a type C port. Or maybe it's not rated for 60W draw. The model is maxtek sorry I forgot Hotdealsuk is full of die hard show me the proof type of people..but if you do have the time you may come across them.sorry I cannot provide proof..:( ..I shall delete my Hotdealsuk account immediately and hold my head in shame. The model is maxtek sorry I forgot Hotdealsuk is full of die hard show me …The model is maxtek sorry I forgot Hotdealsuk is full of die hard show me the proof type of people..but if you do have the time you may come across them.sorry I cannot provide proof..:( ..I shall delete my Hotdealsuk account immediately and hold my head in shame. I bought one of those and it now charges far slower than my Anker chargers, charging my tablet far slower than the power it requires for basic internet usage, and causing it to run out of power whilst connected to their charger. Does this buzz during the night. My non-USB C Anker one does. Before anyone says it, there is nothing else buzzing about. If so then there's no USB-C on them, no PD. No idea whether the power circuitry is built to last either, I've had cheap hubs go bang under small loads. Anyway it's not comparable so that's that.